Summer is the time to make clothes! 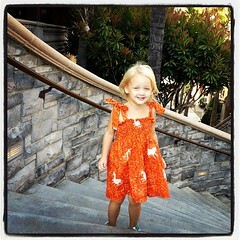 Dresses are my favorite and the girls always love them too. I was lucky enough to get some yardage of the unicorns from Heather Ross old line Far Far Away which is very hard to get let alone afford since the prices are so high since it is hard to find now. 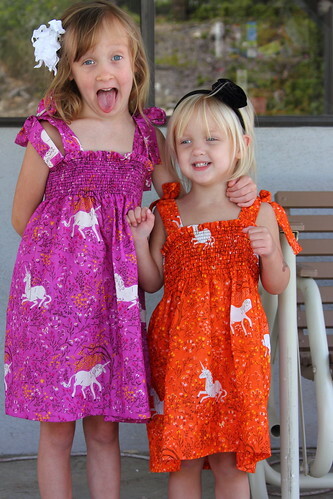 Someone was destashing and I could not pass it up to make the girls dresses out of the prints. 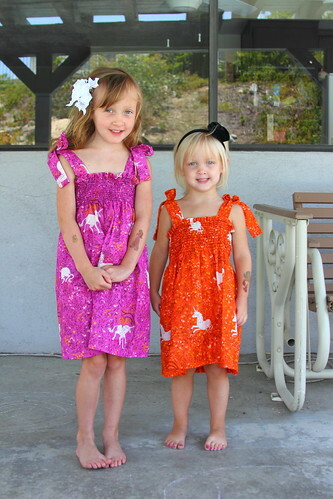 The girls want to wear their unicorn dresses everyday. 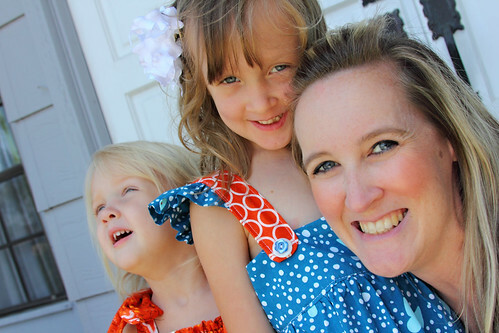 The shirred dress is just one of the easiest dresses to make and I just love them since it lets the girls be able to wear them the longest as they stretch as they grow. 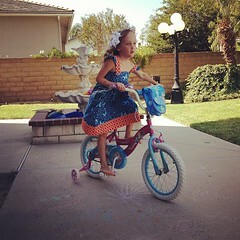 Then it was a dress that I found a cheap pattern for at JoAnn's. It is See & Sew #B5631 if you want to get it. I wanted to make this dress after I saw it in this book but didn't want to deal with it being in Japanese so I called my Mom and we found a pattern then she drafted a pattern for me to add the flutter sleeves. My Mom is the BEST! 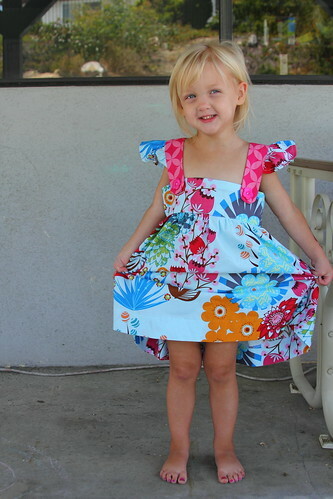 I made Penelope's out of Anna Marie Horner fabric from her Loulouthi line and the straps are from Good Folks line. 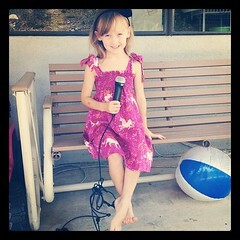 The dresses are alittle big on the girls but I don't care they can grow more in them. Gwen's dress ended up being shorter than I wanted so we had to add the panel at the bottom and I am so glad it really makes the dress even better. 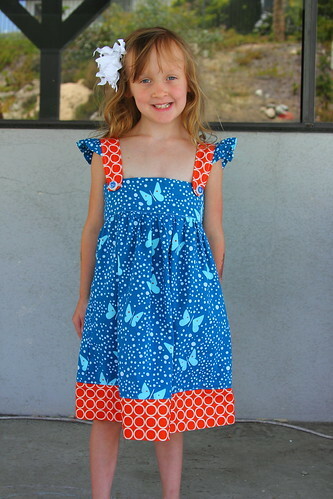 Gwen choose her fabric she just loves blue and loved the Lizzy House butterfly fabric from Hello Pilgrim. Adding the flutter sleeves to the strap really made the dress to me! I just love flutter sleeves. 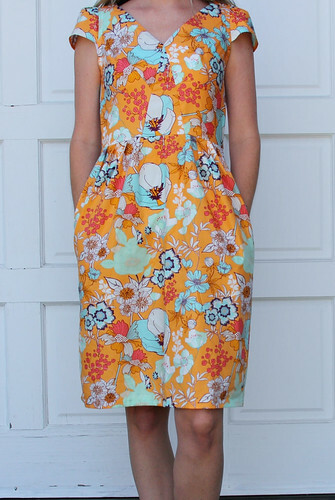 Last of all was a dress that I wanted to make for myself to have a easy comfortable dress for the summer out of some of the awesome fabric that is out there! 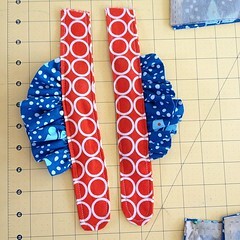 I choose Pat Bravo's fabric from her line Summerlove. The fabric is just so soft and great for clothes. The print is called Beyond Bliss in Tangerine. I LOVE this dress. It even has pockets. The pattern is a Simplicity pattern #2177. I just need a really fun color of a thin belt and I will be set to wearing this dress this summer. Once I get that I will take more pictures. This picture isn't the best since I had Gwen take it so it is at a lower angle. The girls and I are ready for the summer! What great dresses for all of you! Love your fabric choices! Such lovely dresses! I especially love your dress, Darci! I just got some Summerlove, and I agree; it's perfect for dresses! 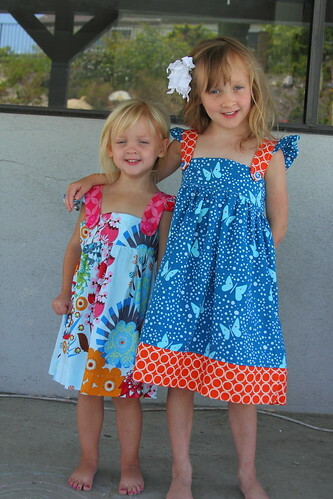 Very cute, both dresses and models! Oh what a great dress! 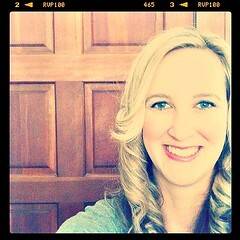 I voted for you in Jen's contest. Good luck - off to look for that pattern!